Amanda K. Miller-Fasshauer’s new dance work “The Liberated Accident” ends with the arrival of a train — or at least it did on Thursday, its opening night. 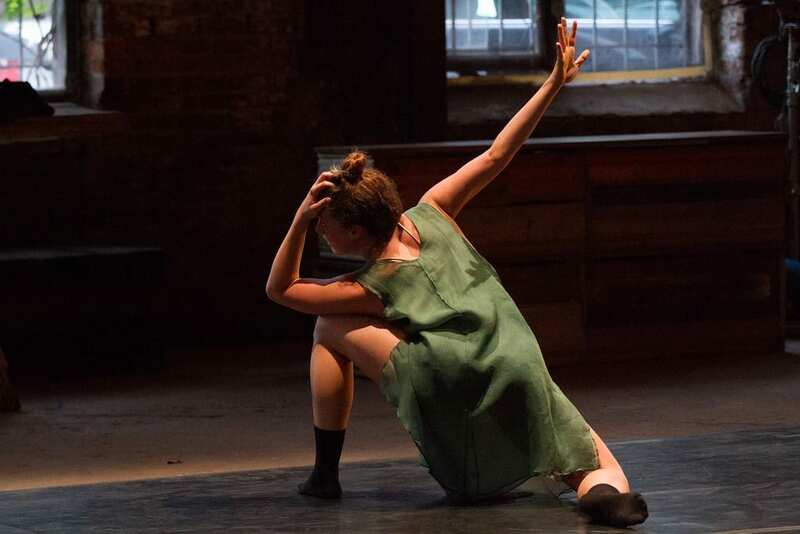 As the title and that event might suggest, the performance — which runs through Saturday, May 11, at the Goat Farm Arts Center as part of its Tanz Farm season of contemporary dance — is delightfully open to ephemerality, happenstance and the environment. This openness is a compact and distinct philosophy regarding process, which produces an open and spacious performance experience. Miller-Fasshauer, formerly the choreographer-in-residence at Ballett Frankfurt under William Forsythe and the founder of Pretty Ugly Dance Company, created the new work for CORE Performance Company of Decatur. Atlanta audiences ostensibly familiar with CORE will be reminded that they’re actually not so familiar with it — at the end of last season, a majority of its dancers, for unrelated individual reasons, departed or retired. The transformation is now complete: the six dancers in “The Liberated Accident” are all new to CORE this season, and not a single former company member remains. Unsurprisingly, interaction among dancers becomes a major focus of the new work. As audience members enter, and continuing intermitently throughout the performance, the dancers wander through and explore the vast warehouse space of the Goat Farm’s Goodson Yard, often glancing at each other, exchanging smiles, nods or brief words, gestures that express a sort of simultaneous curiosity and guardedness, slaked awareness and hungry exploration. The performance opens with dances set to Bach’s Diverse Canons, and Miller-Fasshauer’s movement echoes the mathematical, courtly, patterned, meditative aspects of that music. But there’s also an intriguingly fragmented quality to the work, with choreographed phrases and dramatic situations emerging, disappearing and re-emerging in fractal-like echoes. 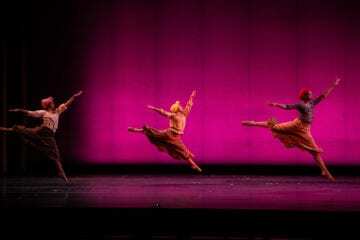 The dancers perform solos, duets and small ensembles but, surprisingly, their individual personalities pop out the most during moments of full-company synchronous movement. 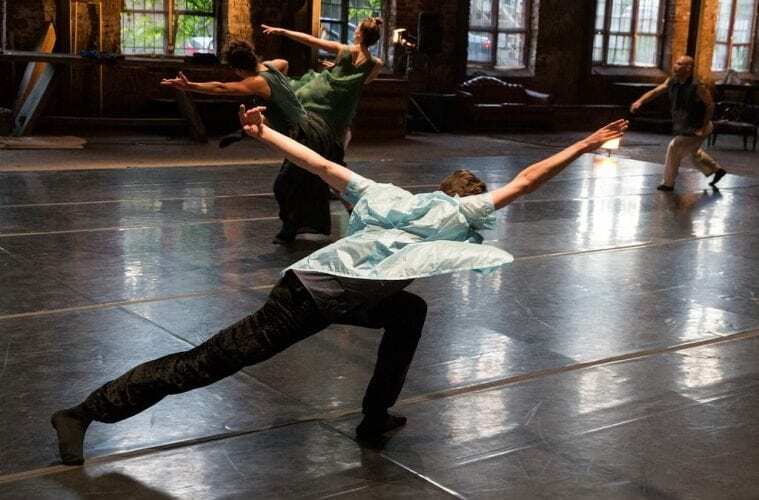 Dancer Erik Thurmond delves deeply into the baroque spirals and spherical geometry of Miller-Fasshauer’s choreography, performed with an elegant, unhurried yet efficient, somehow almost dutiful sense of interiority. A simple sweep of the arm can develop a Zen-like complexity, and it seems a thorough match of movement style to dancer. Thurmond is prominent in the second movement as well, as he recites a parable about love to Miller-Fasshauer’s childlike questions and interruptions. The final section, set to music by Fred Frith, takes a more ominous turn, and it’s also the one that feels the most dramatically cohesive. Natural light was gone by that time in the evening, and the space took on a more dreamlike aspect, where movement seemed to be both contained and unwinding. On opening night a train passed and, visible from the windows, was beautifully lit. The artists rushed over to wave to it and then returned to sit in a circle in the center of the space, palms up and open, patting the backs of their hands rhythmically on the floor in time to the sound of the train as the lights faded, the train’s overwhelming repetitive and rhythmic noise a preternaturally fitting end to what had come before, listening to the train in total darkness. The cumulative feeling of watching this disparate, acceptant work was like discovering a beautifully fragmented ancient ruin, one that seems to have opened itself to the vagaries of time almost by design, as if this was the original intention of its architect, even the driving philosophy of its creation. Trains often pass by Goodson Yard on the nearby railroad tracks during performances, but they’ve seldom been welcomed into a work with such an intriguing sense of receptiveness.